"In most places single layer cultivation is the most viable solution"
"Whilst the multi-layer indoor farming systems are very neat, we believe the biggest turnover can be created from conventional, single layer cultivation - simply because that's the most viable solution economically in most places", according to Jeroen Smit. Last year he became the new CEO of Hortiplan. 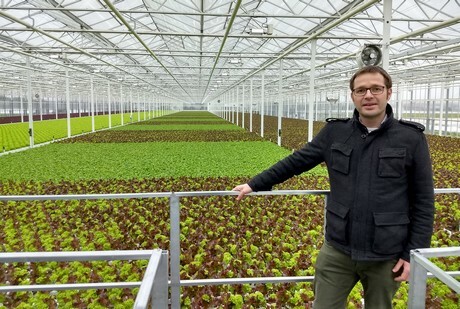 The Belgian company has been active in the production of hydroponic systems for leafy greens and vegetables for a quarter of a century. Growing lettuce on water might seem like a recently booming business, but it’s been happening for a while now. The first installation realized by Hortiplan, for example, dates back to 1994 and is still in business against minimal operational costs. While the basic principle is still the same, the system has been updated since then, as was the company itself. 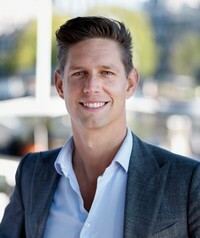 Last year Jeroen Smit became the new CEO, and Bram Vanthoor joined as the international business development manager. Both with a background at Wageningen UR, they look forward to drive innovations and growth within the company. Jeroen and Bram met while studying agricultural techniques in Wageningen, both specializing in horticulture. While Bram’s path brought him to a PhD in international greenhouse design, then led him to Mexican horticulture and finally brought him back to a research position at Wageningen UR, he didn't hesitate when his college friend asked to join him with Hortiplan. "The Hortiplan mobile gully system has proven to be a technical success in growing lettuce and leafy greens in an efficient way. Also, the mother company Arvesta invests heavily in further innovation. 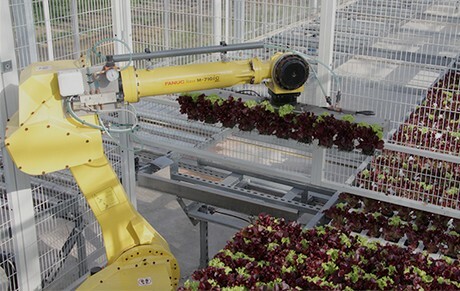 The combination of growing plants and automation is a unique opportunity", he explains his choice. Jeroen has a more strategic and managerial background. A career at Stork and McKinsey brought him in touch with Arvesta - the parent company of Hortiplan. After researching the growth potential for Hortiplan, he was asked to put into practice this plan by himself. Arvesta is Belgium’s biggest agricultural enterprise, active in various industries like retail, animal feed, crop protection, and fertilizers. "The company's mission is to grow together with farmers by optimizing their profit. To reach this goal, investing in agricultural and horticultural innovation is a must. That's what we're doing right now." Currently, Hortiplan is one of the global leaders in automated growing solutions. 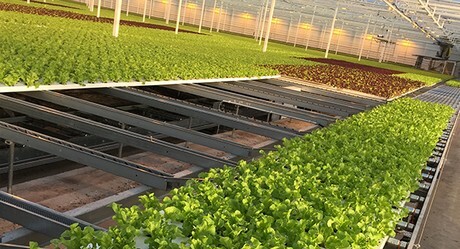 If you ever had the chance to take a look inside the North Shore Greenhouses, or in the Lufa Farms enterprise, the level of automation in these farms may have caught your attention - and those are both fully automated leafy green production systems by Hortiplan. "Labour nowadays is a major issue amongst growers. Even if the cost of labour is not a problem, the availability is - as is training and education. The indirect costs rise easily. With automation, you are sure to have a grip on it", Bram Vanthoor explains. "We see for example that growers in the US or Europe automate the whole latter, whereas growers in other locations choose to automate part of the installation. If it's a complete system or just part of the system being robotized, proper automation offers you more control." Automation is not the only reason why systems to grow lettuce on water are meeting growing demand. Traceability, food safety, and touch-free growing are important topics nowadays. With the E.coli outbreak of last year fresh in mind, but also thanks to big retail and food service chains choosing for a protected way of growing, the US market is booming. "Remarkable is how the projects are up-scaling as well. But let's not forget Belgium and the Netherlands. In these markets we're active in horticultural automation and in the mobile gully systems." As said, Hortiplan is not only active nowadays, but is also planning to grow. "We're investing to keep and strengthen our position", Jeroen confirms. "As said, our goal is to improve a grower’s ROI with our solutions. Therefore we are in constant contact with the market and value the information from our partners, customers and people." Well - let's make it a bit more concrete. What can be expected? "We're researching multilayer solutions, and are constantly working on new products for the mobile gully systems. Plant or picking robots, or box stacking solutions", Bram explains. 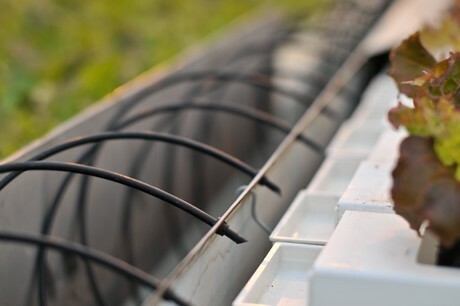 "Whilst the multi-layer systems are impressive, we believe the biggest turnover to be created from conventional, single layer cultivation, simply because that's often the most viable solution economically. With ROI being top of mind for both growers and investors, we help them calculate the best system for the given circumstances. In most cases that proves to be a single layer cultivation system. When climates are more extreme or when horticulture knowledge is limited it is a different situation." It might seem strange for a company producing technical solutions, but according to Jeroen and Bram it's not just techniques that will help them grow. "It's not just about customizing the solution to a customer's needs and installing the gear", Bram laughs. "Even when we calculate the ROI from the beginning, even when we're part of the project from the start and even when the system is fully adapted to local circumstances, it's still only a part of the story. It comes down to the success of the grower and skilled local labor in the long term. Especially with many horticultural newbies entering the industry nowadays and with knowledge being needed worldwide, to us the success of a project isn't there when the installation is completed. To make sure growers make the most out of it, we're in contact with various crop consultants and connect them with the growers or investors to help them make most of the system." Meet Hortiplan on the Fruit Logistica in Hall 8.1, Stand A-18.